My trip to Chicago started super early yesterday with a 6:43 am flight out of San Francisco. I'm very happy to have a couple of days off to visit my friend Jill and to enjoy the race. 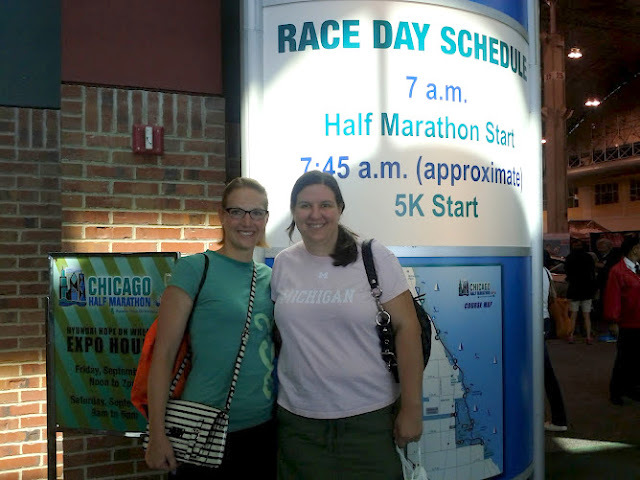 We headed to Navy Pier for the Chicago Half Marathon expo today shortly after it opened to get our race goodies; Jill is running the 5K. There weren't many people there yet, so we had ample time and space to avoid lines and to enjoy the booths. This was Jill's first race expo and I was super excited to go with her! Packet pick-up was super easy and I love the shirts. 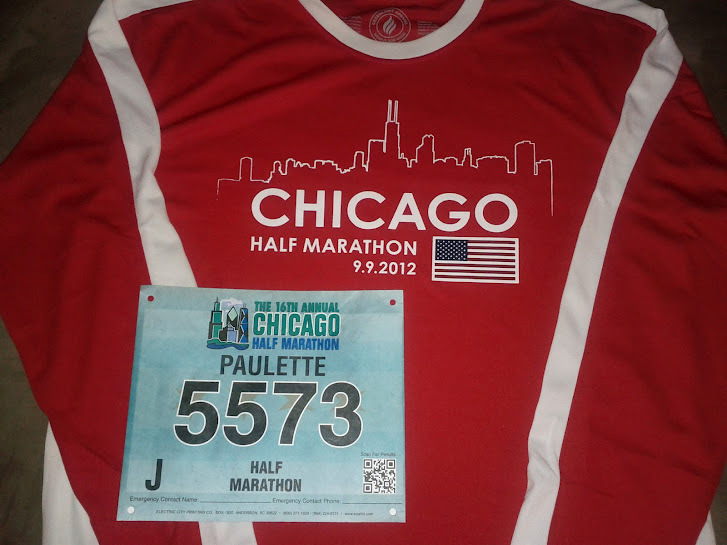 The shirts are unisex which is a little unusual for a bigger race, but the long sleeve, red and white design is great. I tried not to extend my new bad habit of buying random items at race expos, but that didn't work out. 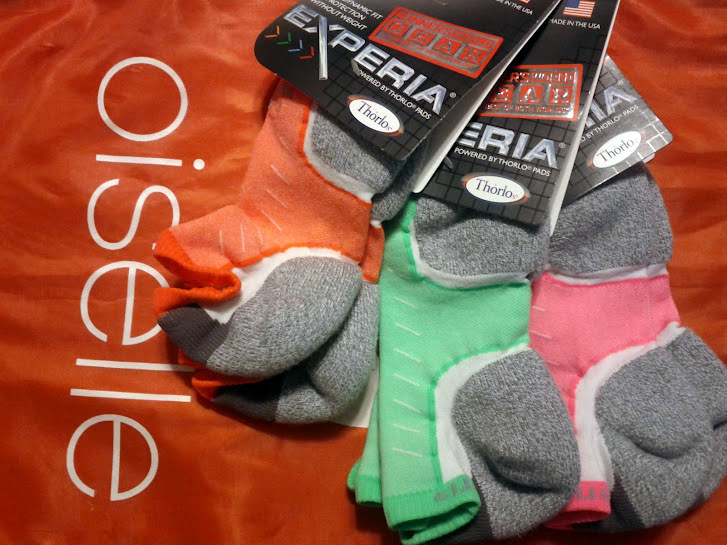 I picked up some super cute bright Experia socks (I wear them anyway...might as well get more when there is a better deal, right?) The colors are even brighter than they appear in the photo! After that we went by the Sweaty Bands booth and looked at all the fun designs. Jill and I split the buy some get one free deal and I picked up a pretty ribbon headband that matches the Oiselle indigo color perfectly. We even scored some cute sale ones. I feel like I can never have enough of these things because I wear them daily and they do eventually wear out. The only other purchase was a second Stick. I've been wanting to buy a second one for my desk at work because I so often run from work, and the other one lives at home. I didn't carry mine on the plane for fear that it would get confiscated by TSA. The guy at the Stick booth today said they have a letter from TSA saying the ones that have been confiscated were a mistake, and that if people take them out and place them in a bin to go through security they are fine. I hope he's right, because that's how I plan to get it home! I was seriously missing this thing after my run last night. Now that the expo fun is over, I can't wait for race day! I love the colors of the socks you picked. I also looked up The Stick because I had never heard of it. I would love to try one out! Try it! I'm a huge fan. that's too crazy that tsa confiscated sticks! it's like at the louisville airport where they keep all the little mini lousiville sluggers in a case that they confiscated! Oh boy, gotta love TSA. I got it through but they took it to a supervisor!